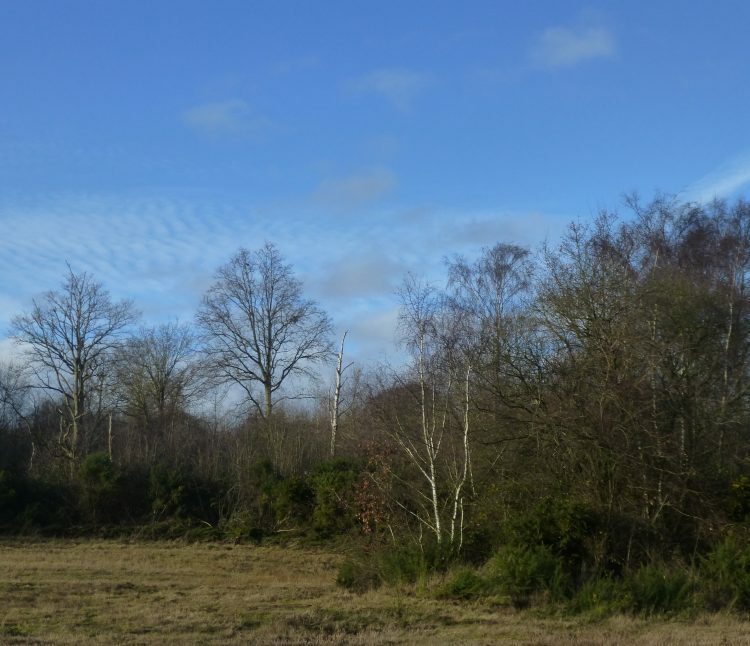 So, here it is – the last painting in my ‘Twelve Months in an Essex Wood’ project, Essex Wood: December. This obviously does not show the wood itself. It was a dull misty day and the light in the wood was very poor. 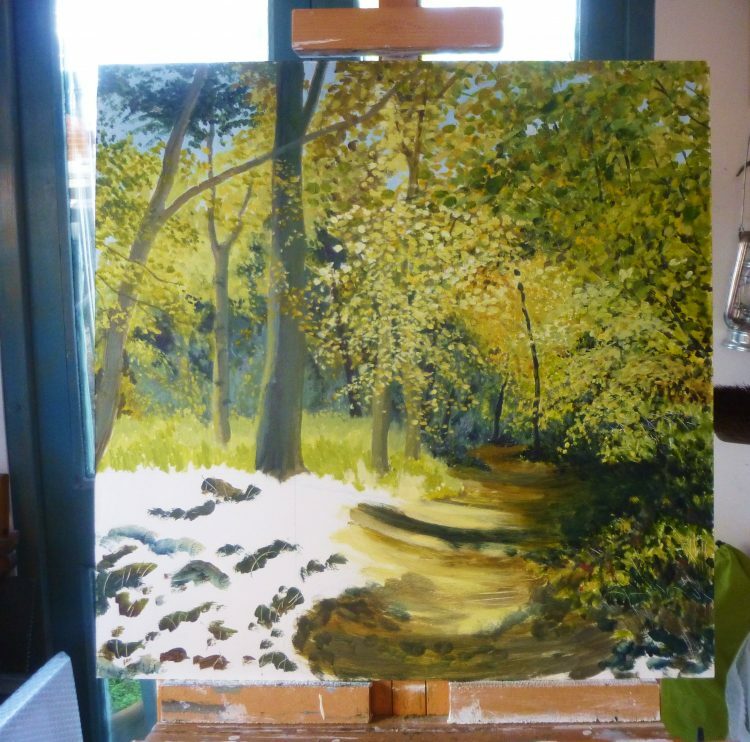 So instead I decided to paint the view looking along the track as I walked away from the wood for the last time. The last time, that is, in 2016, as I will certainly be going back to enjoy the nightingales and bluebells again in the spring! This has been such an enjoyable and rewarding project. 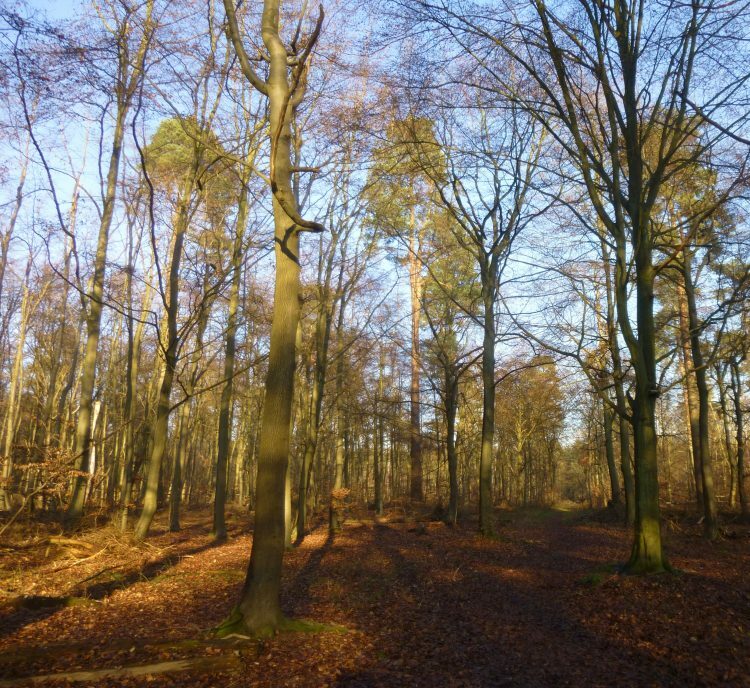 It was really interesting to observe the changes in the woodland environment through the year, and the varying cycle of plants, wild flowers, and birdsong. It would have been worth doing – just making the visits and doing the walks – without the painting! But I have really enjoyed doing the paintings, too – they have all been a struggle, but I’ve learned so much from wrestling with them. This afternoon I’ve been designing the cover for my Twelve Months in an Essex Wood books! That’s the next thing . . . news on this in a couple of weeks! 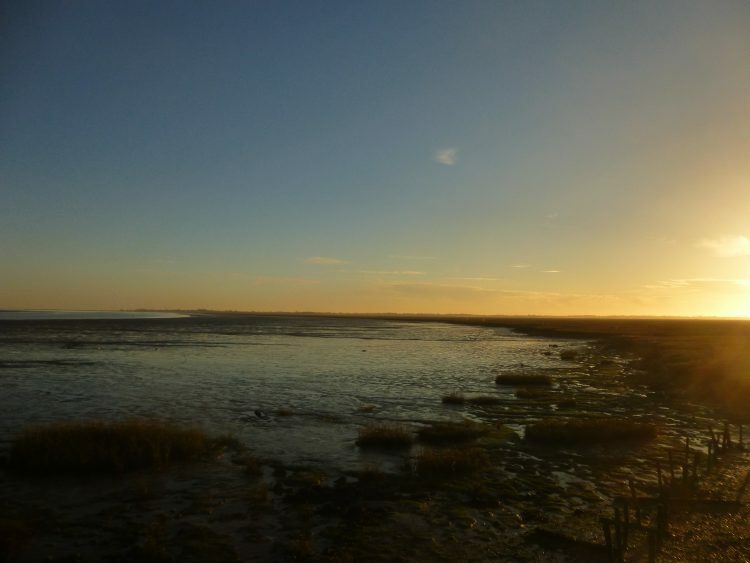 Just back from a couple of days in Norfolk. After all the fog and thick hoar frost that we have had, Tuesday was a beautiful clear sunny day – though still cold! 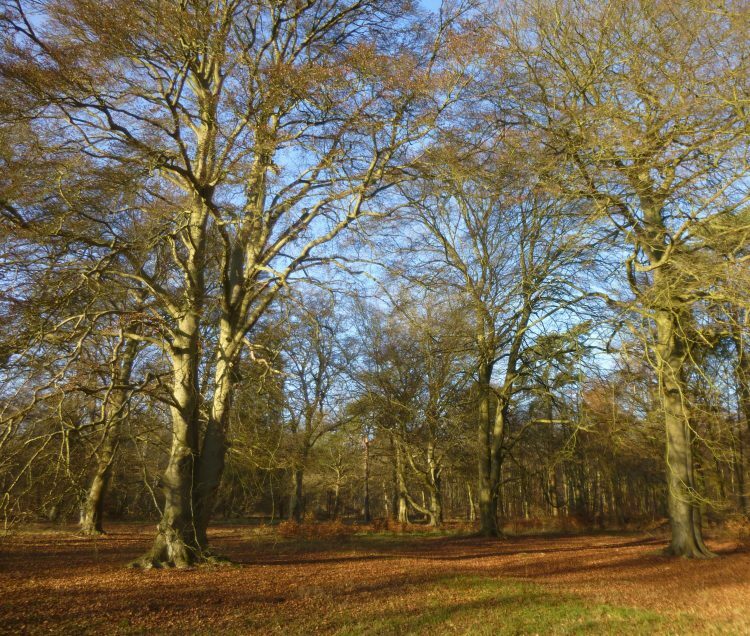 I stopped on the drive up to photograph the beautiful mature trees in Thetford forest. Back home now, I spent the afternoon in my studio working on Essex Wood: December. There was quite a lot to put right so progress is slow, but it’s gradually coming together. This is what it looks like so far . . . 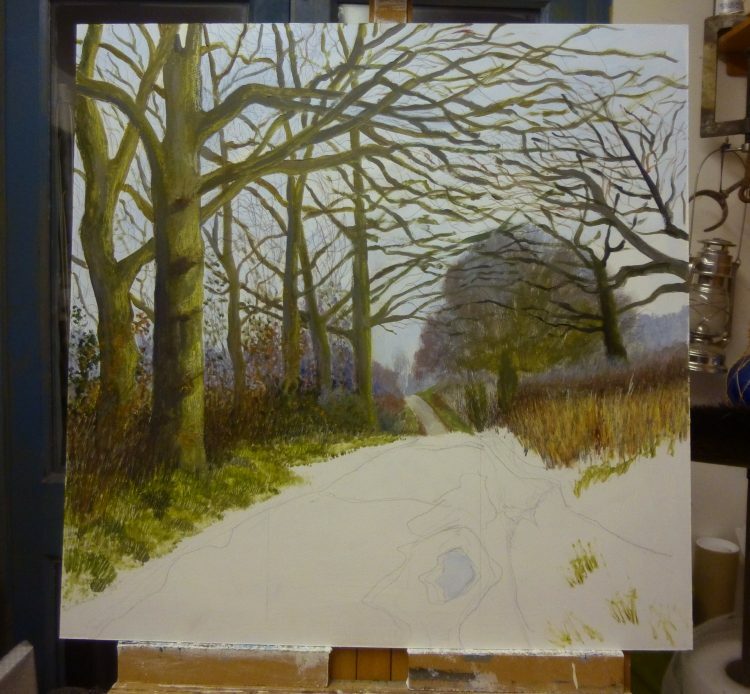 I am hoping to finish it next week, and then move on to Fingringhoe Wick: January! It will be February next week – where did January go . . . ? 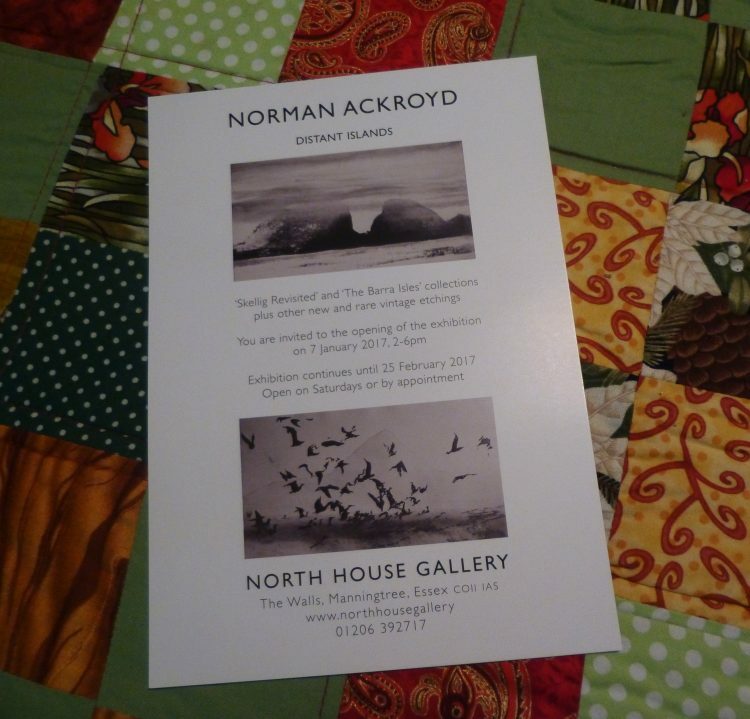 A sunny – very cold – afternoon, and we went over to the North House Gallery at Manningtree to see the Norman Ackroyd exhibition. The show, called ‘Distant Islands’, has etchings from the Skellig Revisited and The Barra Isles collections, and also some other new work, and rare older etchings. I particularly liked Cow Rock, Co. Kerry, and Evening Rain Derwent Water, and I love the misty atmospheric effects of cloud and rain and mist that he creates. The North House Gallery is open on Saturdays and by appointment – www.northhousegallery.co.uk – and there is unrestricted street parking almost outside the gallery. On the way home there was the most beautiful sunset. There was no cloud in the sky, and the sun was a huge low orange disc with the sky merging from a turquoise blue, to apricot, rose and violet towards the horizon. Wonderful! But by the time I got home it was only 1 C, so it’s going to be a very frosty night! And in the studio, I’ve been starting Essex Wood: December. This was at the end of Thursday . . .
. . . planned and a few key bits drawn out. Not much paint yet. Then this was yesterday . . .
Progress is slow! I got a bit more done this morning before we went out, and I’m hoping to get a lot more work done tomorrow afternoon. The sharp-eyed amongst you may have noticed that I’ve changed the name of the last little boat I posted from Waiting for the Tide IV to Undercover . . .
Well, this one is Undercover II! 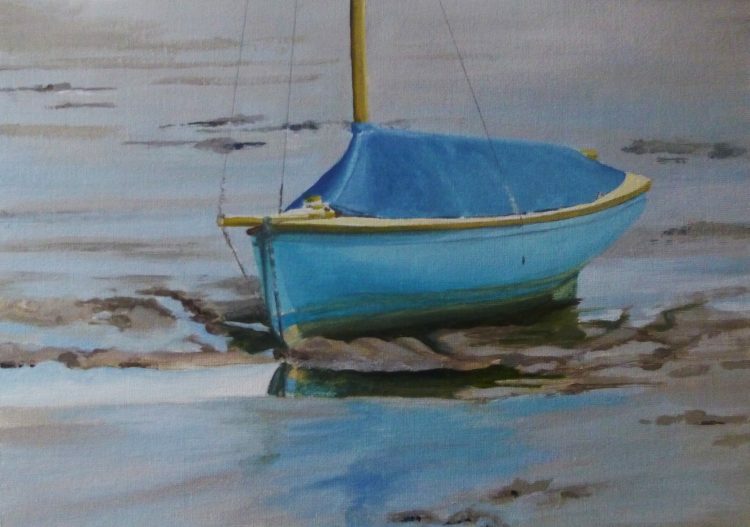 Another Blackwater sailing dinghy, from Heybridge Basin, this is the third one for the Geedon Gallery’s Spring exhibition. I’ve got a fourth one to do, but I’m going to have a little boat-break now, and get Essex Wood: December done. A book recommendation! ‘Snow’ by Marcus Sedgwick . . . This is a fascinating book, with six chapters imitating the six sides of a snowflake. It explores snow in art, literature and legend, and also the science of snow, alongside the author’s experiences of snow on the edge of the French Alps where he now lives, and memories of his childhood winters in Kent. It has a very charming image on the cover: an oil painting by Peter Brook called ‘Snow on Snow’. It is published by Little Toller in their Monograph series. I had already read another book in this series – Adam Thorpe’s ‘On Silbury Hill’, before I went to Avebury last spring. That was a fascinating book, too. And I’ve just bought a third – ‘The Ash Tree’ by Oliver Rackham! 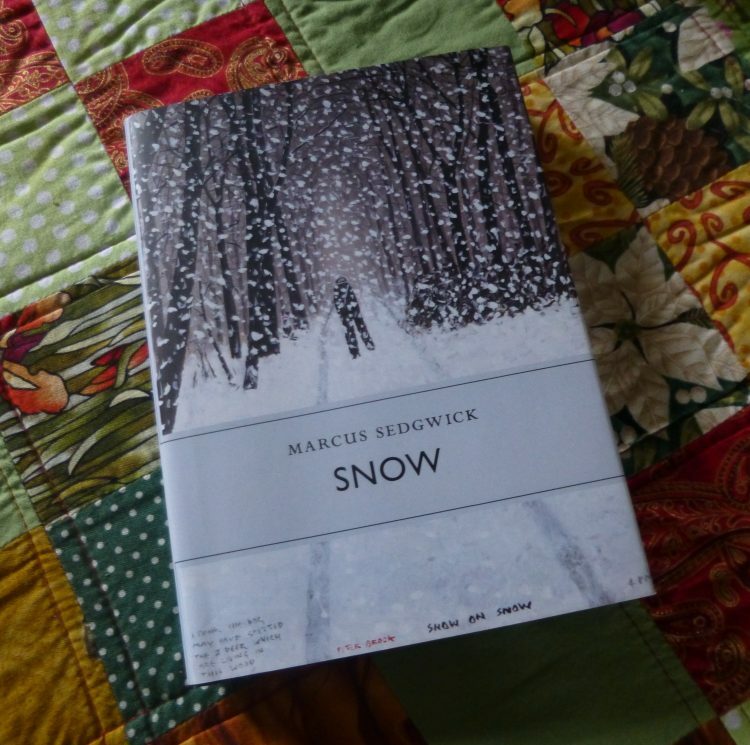 ‘Snow’ is available directly from the publishers, www.littletoller.co.uk, although I bought my copy from our excellent independent bookshop, Red Lion Books, in Colchester High Street. Making a start this afternoon on Undercover II, which. along with Blackwater Reflections II and Undercover will be bound for the Geedon Gallery’s spring show. I’m painting sitting down at the moment, as I’m still not too comfortable to stand for long after my recent op. This is fine for these small paintings, although I shall be standing again for the next big one – Essex Wood: December – which I am looking forward to getting started on next. 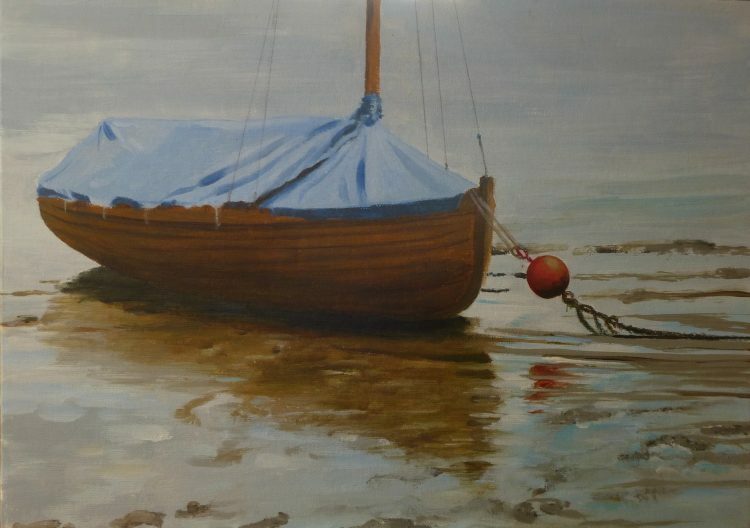 A new little boat painting – Undercover. I found this one at Heybridge Basin on the Blackwater estuary. I liked the light and subtle reflection on the wet mud and in the water in front of the bow. 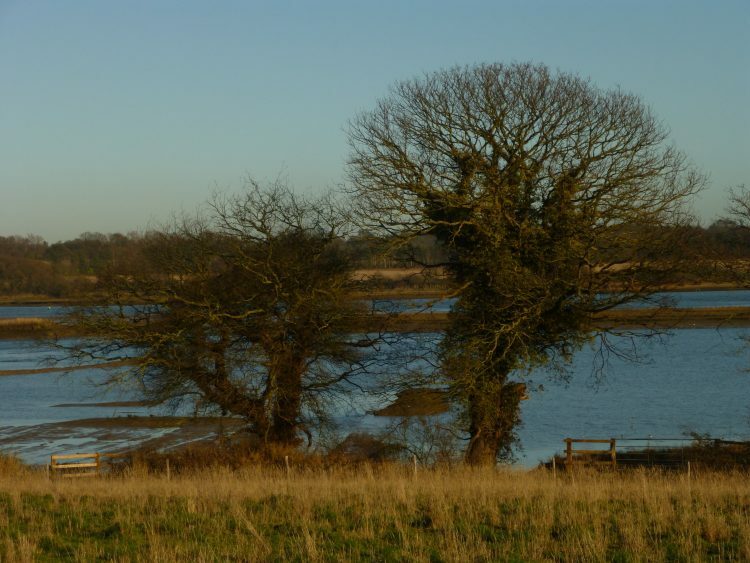 It was a lovely bright morning so I decided to make my January visit to Fingringhoe Wick. This is the beginning of my 2017 project – see post on January 1st. I went to the viewing point just east of the Geedon Hide first. 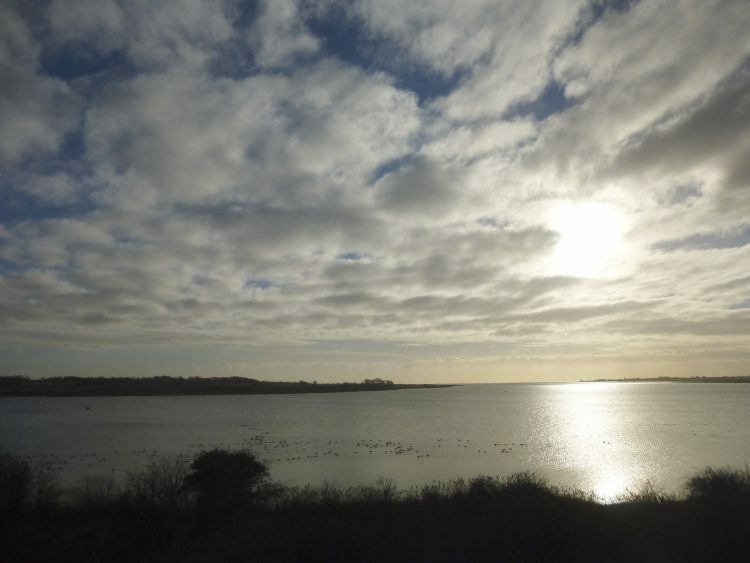 The sun was dazzling on the Colne estuary. A large flock of Brent geese kept up a continuous honk of conversation. Towards the shore a group of Shelduck drifted peacefully on the high tide. Graham gave me a pair of brilliant binoculars for my birthday on Sunday – my old ones looked as if they had a permanent fog in them! These new ones are very light but very effective. This was their first outing! 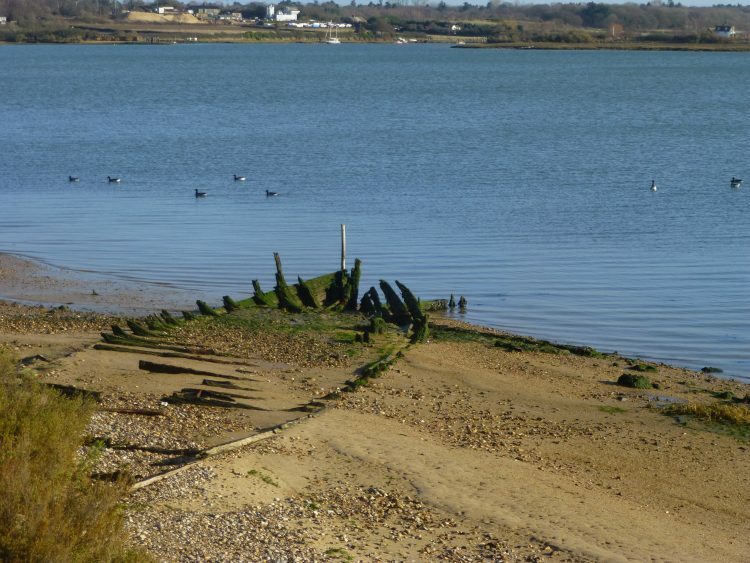 I walked further along the shore to a gateway overlooking a small beach where posts from an old jetty marched down to the water . . .
. . . and then on to Robbie’s hide where the wreck of a wooden boat is almost buried in the sand. With my new binoculars I was able to see redshank and turnstones pecking around at the water’s edge really clearly. 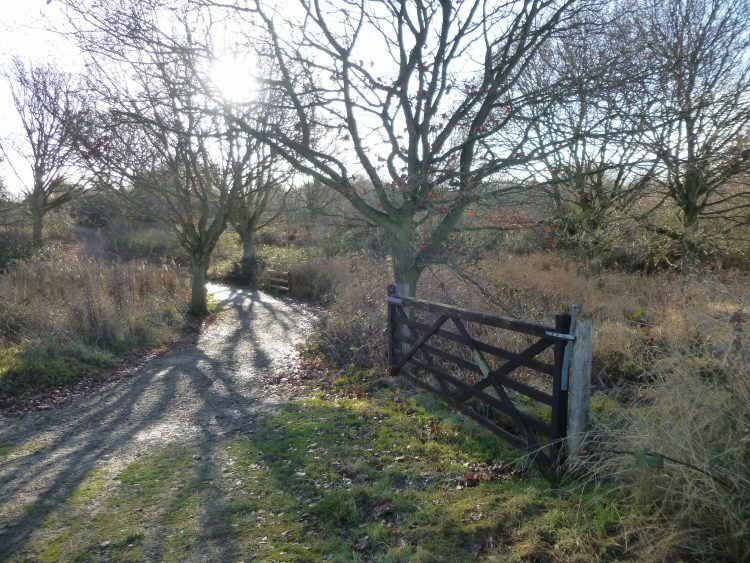 Away from the estuary the nature reserve is partly wooded and criss-crossed with paths and tracks. It was quite muddy, but I could see lots of varied potential pictures for the future months. Back home I was very pleased to find a cheque from the Geedon Gallery! Poppy on the Blackwater was the only unsold painting from the four I put into their last spring exhibition. I left it there for the year, accidently, and it has unexpectedly sold! Here’s number eleven in my 2016 ’12 Months in an Essex Wood’ series – a bit late, but I’m catching up. 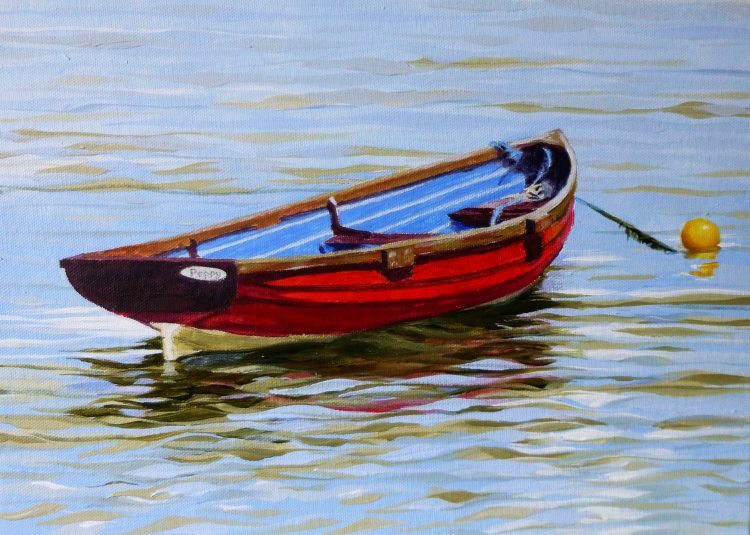 Number Twelve – December – is going to have to wait a bit now, as I have to get down to painting some dinghies for the Geedon Gallery spring exhibition! 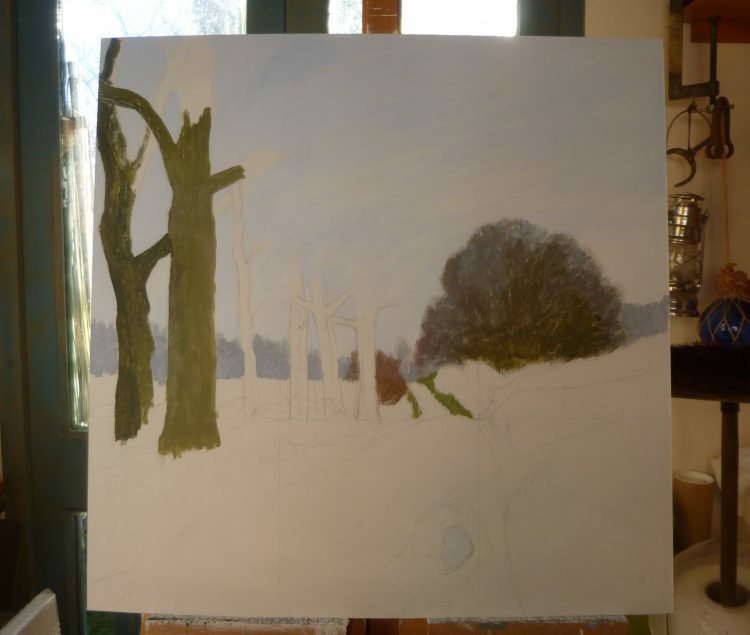 A couple of hours in my sunny studio today, making progress on Essex Wood: November. I love making new plans for a New Year – so here are my ‘art’ plans! 12 Months in an Essex Wood BOOKS!! I’m using the twelve images of the big pictures, plus my notes from each months visit. I will get the books produced by Snapfish or possibly Blurb, and will launch them at this year’s Lexden Arts Festival. Exhibitions: these are the ones I know about so far! 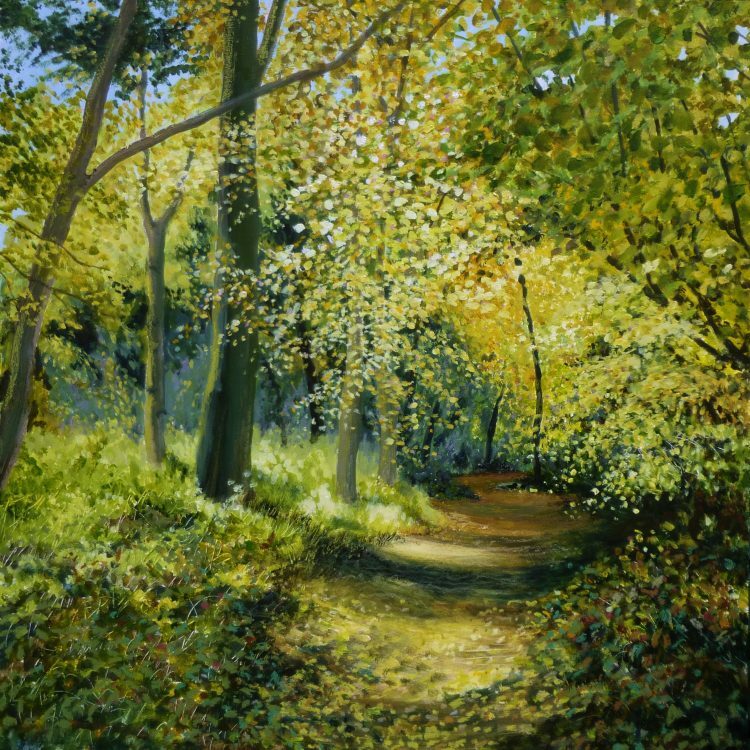 The Geedon Gallery Spring show from 8th – 23rd April. 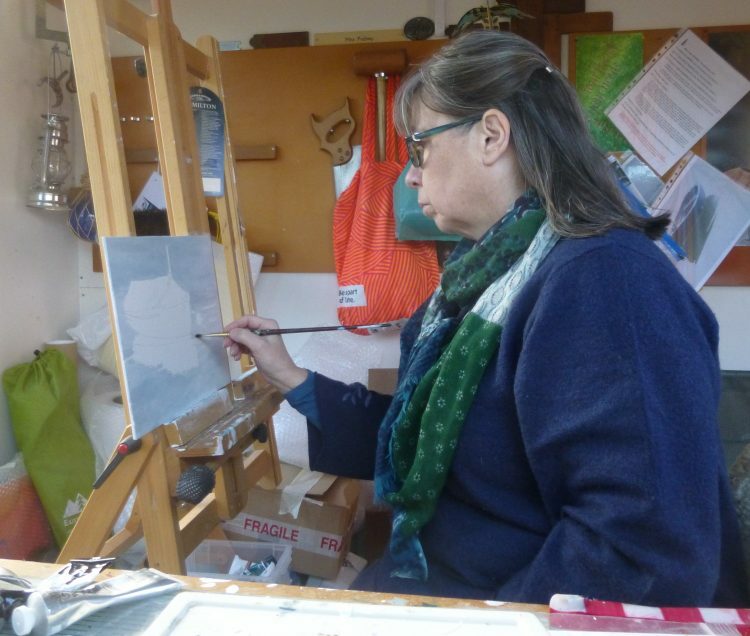 Lexden Arts Festival 29th April – 6th May. I may submit something to the New English Art Club’s Open exhibition, and may show at the Haylett’s gallery in the summer. 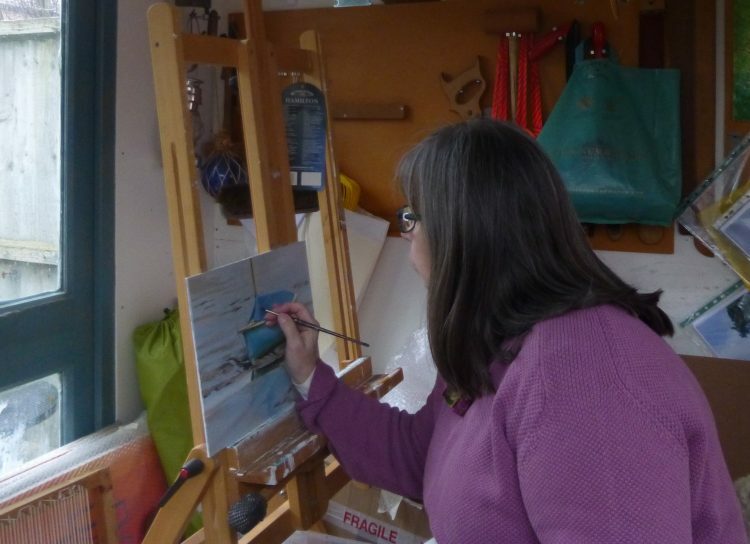 I also plan to have another 2 weekends of Open Studios in September. I’ll keep you posted about where I’m exhibiting as more gets planned. My BIG painting project for the 2017! ‘A Year at Fingringhoe Wick’. 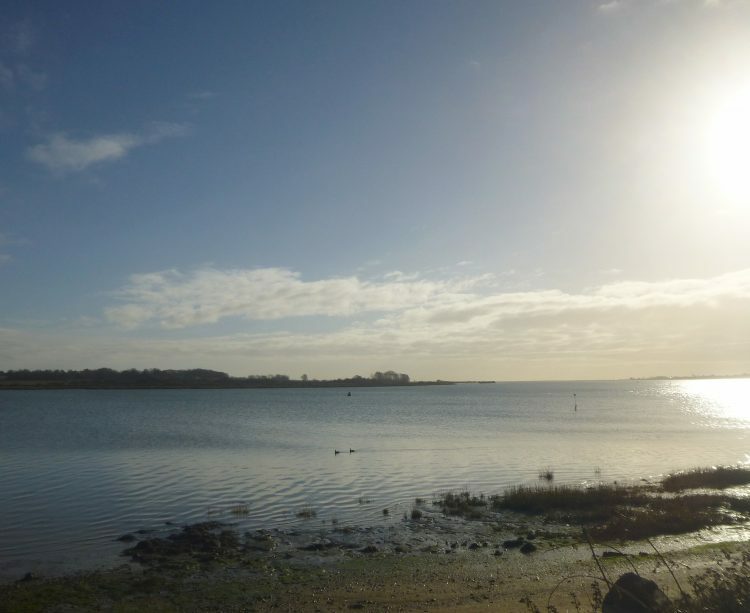 This is a nature reserve on the Colne Estuary owned by the Essex Wildlife Trust. 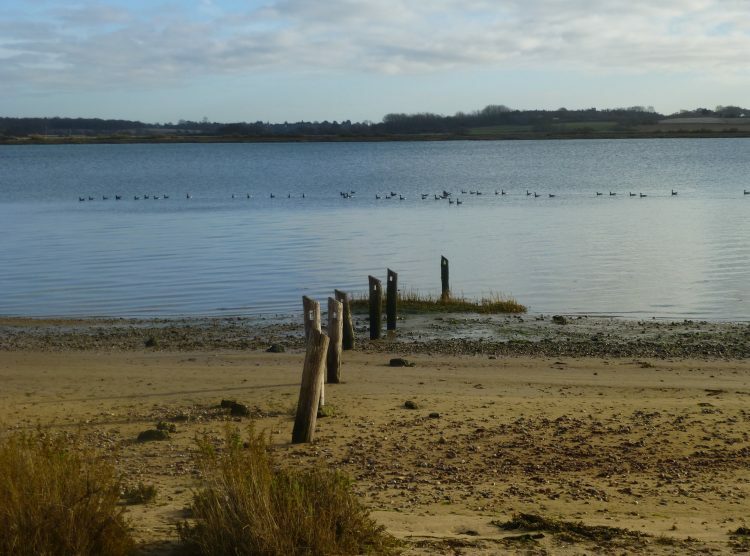 It is over 200 acres, and has really mixed habitat, of saltmarsh with wonderful views of the estuary, Mersea Island and out to sea, heathland, woodland, ponds and lakes, as well as cultivated farmland all around. It will give me lots of scope to paint 12 very varied monthly pictures, including some wonderful big skies. On social media I am planning to start using Instagram as well as my ‘Sally Pudney Artist’ Facebook page and this website. Graham and I walked round some of Fingringhoe Wick last Wednesday to assess whether it was a suitable site for my new project. It had been a foggy morning, but cleared to a beautiful, still, sunny afternoon with a clear blue sky. We had a lovely walk and saw lots of potential paintings! 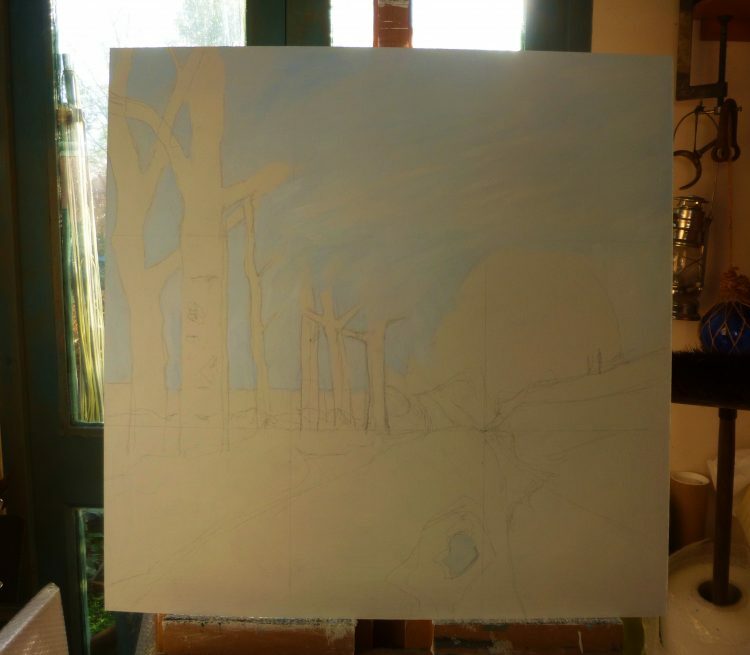 I have, of course, got some ‘finishing off’ to do – Essex Wood November needs to be completed, by the end of this week I hope – and Essex Wood December needs painting! 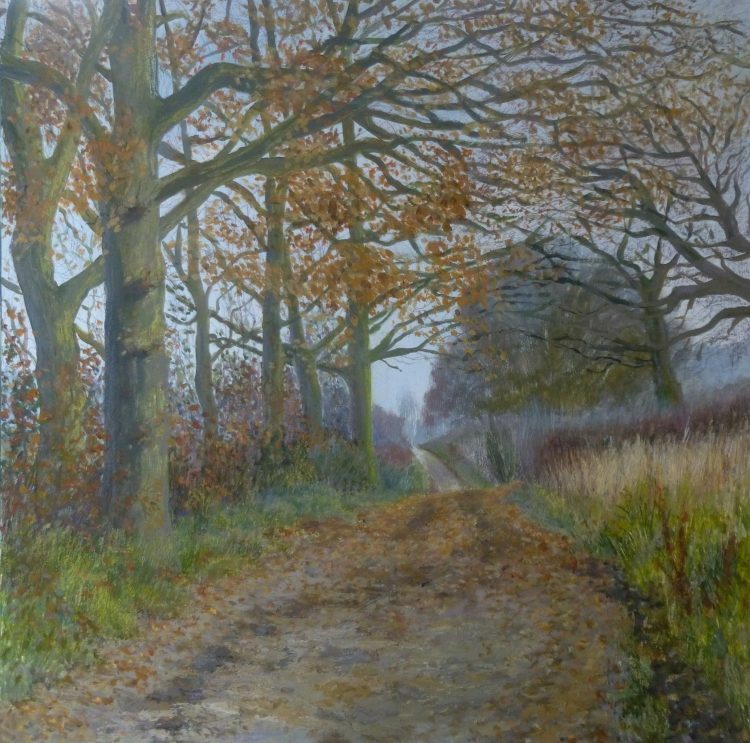 Then I am very aware that I have only painted one picture of my Ridgeway series so that also needs working on. Lots of work!